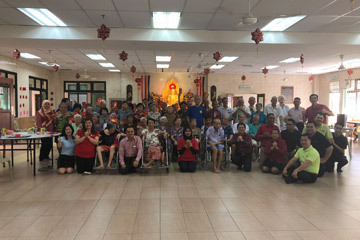 PENANG, FEBRUARY 2018 – In conjunction with Chinese New Year, Berjaya Penang Hotel initiated a meaningful CSR event at the old folks’ home of the Penang Buddhist Association. This recent visit was led by Mr Tan Yew Jin, the Acting General Manager of Berjaya Penang Hotel on 13 February 2018. With a team of volunteers from the hotel management and operations, they assisted in the preparation of healthy vegetarian dishes for 51 senior residents at the old folks’ home. The team also distributed mandarin oranges and ang pow (red packets) to make the occasion even more joyous. With thoughtfulness, the volunteers also chatted to the elderly and kept them company throughout the meal. 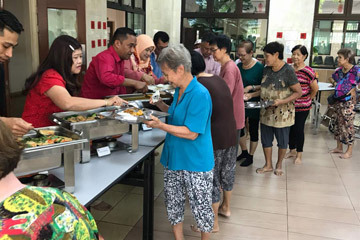 “Although it is a simple lunch, all of us feel particularly fulfilled that we have brought smiles and warmth to the old folks’ home before Chinese New Year,” said Mr Tan Yew Jin in a grateful tone. The Penang Buddhist Association Senior Citizens' Home was established to house the elderly between 60 to 75 years old with no immediate family members.